Need Some Vegan Dairy Substitutes for Baking and Cooking? Read On! Maybe you're thinking about going vegan, so you need some vegan dairy substitutes, or maybe you're allergic to milk and looking for lactose-free dairy substitutes or trying to keep kosher. Whatever your reason, reducing the amount of dairy in your diet can be a healthy way to lower your fat and cholesterol intake. Here's what you need to know about dairy substitutes for vegan cooking and vegan baking, including non-dairy soy milk, vegan margarine, non-dairy ice cream substitutes and more. 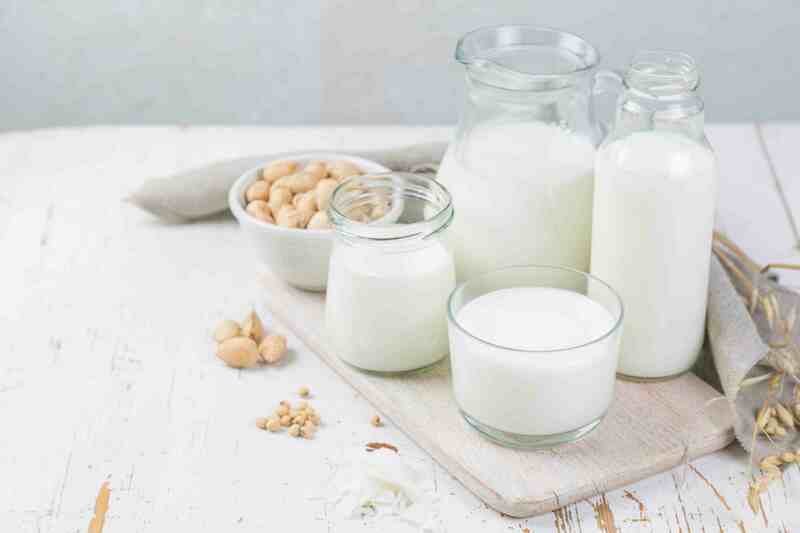 The first dairy substitute you probably want to know about is milk! You may have heard about soy milk, but what are some other dairy substitutes for milk and how can you use them in baking or cooking? Soy milk may be the most popular, but you may also want to try almond milk, hemp milk or rice milk. Vegan margarine is the best non-dairy substitute for butter and will work well with anything you need butter for, whether you're baking cookies or you need something to spread on your toast. Many margarine brands contain a bit of dairy in the form of lactose or whey, making them unsuitable as a dairy substitute, so be sure to read the label carefully. The only downside to using margarine instead of butter is that it may contain hydrogenated oils, which are not healthy. If this is a concern for you, look for a dairy-free vegan margarine that contains no trans-fats or hydrogenated oils, such as Earth Balance, a popular brand amongst dairy-free eaters and vegans. Learn more about vegan margarine. If you need a dairy-free substitute for cheese, I recommend looking for a cheese substitute that is labeled vegan if you are lactose intolerant or have a milk allergy. Some brands of non-dairy soy-based cheese contain a bit of casein or caseinate. Not a problem if you're just looking to reduce the dairy in your diet, but not helpful if you're fully vegan! So, be sure to read the label. If you avoid soy as well as dairy, look for vegan almond milk or rice milk cheese.
" California Alfredo" ( CC BY 2.0) by Nikki L.
If you're cutting dairy from your diet but you miss sprinkling Parmesan cheese on your pasta or garlic bread, you need to try a product long popular amongst vegans, called nutritional yeast. This is a flaky powder with a naturally cheese-like flavor. Nutritional yeast is similar to brewer's yeast - but careful! They aren't the same! Shop for nutritional yeast in the bulk foods section of your local health food store or co-op grocery. You can also keep an eye out for a non-dairy vegan Parmesan cheese substitute called Parma, or try shopping online at a vegan specialty store for Parma. Just like regular Parmesan cheese, Parma doesn't need to be refrigerated, so it's easy to buy online. Need a non-dairy substitute for sour cream? Tofutti brand is to the rescue! Found in the refrigerator section of natural foods stores and larger well-stocked grocers, Tofutti non-dairy Sour Supreme and non-hydrogenated Better Than Sour Cream are both delicious dairy-free choices. Learn more about non-dairy vegan sour cream. There really is a dairy-free substitute for everything, these days! From the fine folks at Tofutti is this new dairy-free ricotta cheese substitute which is perfect for vegan lasagna recipes, stuffed shells, or anything you need ricotta cheese for. If you can't find the store-bought version, try this recipe for homemade ricotta cheese substitute made with tofu as a base and plenty of flavorings for a good dairy-free stand-in. When it comes to a non-dairy alternative to ice cream, vegans and the lactose intolerant have a few choices. More and more grocery stores are stocking non-dairy ice creams, and natural food stores stock a myriad of choices, including coconut milk based ice creams for those who avoid soy, low-fat rice milk ice cream, and of course, soy ice cream as well. If you'd like to try making a homemade non-dairy ice cream, try this simple recipe for a vegan chocolate sorbet or this vegan strawberry sorbet. There's still quite a few dairy products you might be craving (or need for a recipe!) that are still unavailable to buy at the store. We've come a long way with commercial substitutes, but there's always room for improvement. In the meantime, try making your own homemade Indian paneer cheese from tofu, or, use Italian spices to make a ​tofu ricotta cheese substitute, perfect for making a low-fat dairy-free lasagna (pictured).